With all the hoopla about yet another new transit plan for Toronto, it’s time to remember that the 50th birthday of the Bloor-Danforth subway is coming up in a week’s time. Depending on which event you consider the “real” birthday, it will either be Thursday, February 25 (the anniversary of the ceremonial opening) or Friday, February 26 (the first day of revenue service). Over the next week I will post some ephemera from that era when Toronto launched on a major subway building project. The expected construction time was 9 years broken down as the University Line (3.5), Greenwood to University including Greenwood Yard (4), and the remaining pieces east from Greenwood to Woodbine, and West from St. George to Keele (2.5). Almost all of the line was built cut-and-cover , and the city expropriated a swath of houses along most of the route to the north of Bloor Street and Danforth Avenue. This strip is now home to parking lots, a few parks, subway entrances, and the occasional new building sitting right on top of the subway. The original completion date to the terminals at Woodbine and Keele was planned to be 1969, but work was accelerated thanks to additional funding from the Metropolitan Toronto government and Queen’s Park. The paintings showing what the new stations would look like date from 1956 and 1957, before the project had been approved by Metro Council. The map of the route includes the original names for most of the stations including Vincent, Walmer and Yorkville. By the time this was printed, “Willowvale” Station had already changed to “Christie”, but the park to the west retained its original name. 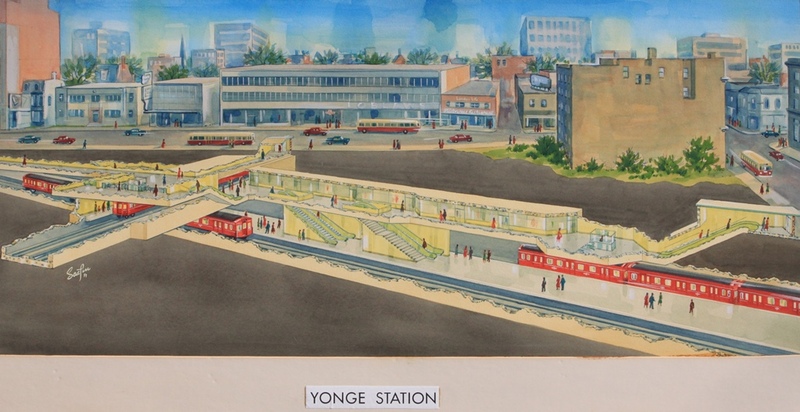 The station illustrations are by Sigmund Serafin whose work also shows up in samples of the original Yonge line station designs. Of the four stations shown here, none was built exactly as shown. You can see the full set on Transit Toronto. The eight water colours were rescued from a housecleaning binge at the TTC in the late 1960s when much material went into various private collections lest it simply disappear. These paintings are now back with the TTC who plan to issue them as posters later this year, and the originals will go to the City Archives. Here is Bloor-Yonge Station in all its mid-50s glory, with Gloucester trains, no Hudson’s Bay building and a lot of Bloor-Yonge streetscape that has vanished over the years. For a detailed history of the Bloor subway, visit Transit Toronto. As you know Steve I was at the subway exhibition at St Lawrence earlier. It was interesting to see how things have changed over the years including some multi-coloured front ends for the first subway trains on the BD. Just curious since you are of a certain vintage Steve… any truth to the urban legend someone placed explosives on the Old Mill at Old Mill station bridge just prior to the subway extension opening? I recall reading somewhere it may have been James’s personal blog about someone doing just that as well as blowing up the Eglinton Station washroom during the Armenian Bomb threats. Steve: I don’t know anything about these incidents, and regard them as urban legends. Not sure how much truth there is to the bit about Eglinton however the only place I heard about it was on James’s blog. Hard to believe how much change the old girl has seen over the years. Arson at Christie, Tunnel fire between Greenwood and Donlands, Garbage train fire at Old Mill.. everything has happened over the years. Steve: Actually the train that burned at Christie was set on fire much further west, around Islington, and for some reason they didn’t stay out in the open where fighting the blaze would have been easier. One of the many lessons learned. Interesting how the same financial issues re-emerge. Pay-as-you-go, as opposed to borrowing the money, does not encumber future generations with debt. As a member of one of those future generations, I say “thank you” to the far-sighted people in the 1960’s. We can “pay forward” this gift from the past by continuing to pay for capital expenditures with current revenue tools and not saddle future generations with debt. This is the article I was referring to. Given the article was written by James himself I was always curious how much of this actually happened. Not knocking you James but some of this seems far fetched. The artist’s rendition of Keele is so much more scenic than the reality, with the green space replaced by a strip mall, gas station, and payday loan operation. One of the limited places in the old city where I’d actually be thrilled if they turned it into a condo. Steve: A common thread through all of the paintings is the warm red brick station exteriors. Not what we got. 1) They expected to run a Yonge–University–Danforth service (as far as Greenwood yard) for 3 years (1966–69). That makes an interesting “what if”, and I wonder how far they really thought that through (is Greenwood a logical end point, especially with the station actually being on Linsmore; and especially the question of what to do with passengers and streetcars on Bloor West once they get to St. George). 2) There doesn’t appear to be any reference at all to service interlining between Y–U and B–D (other than the 3 years of Y–U–D operations to Greenwood), notwithstanding that the map would appear to show the track layout to accommodate interlining. Steve: And of course they would interline Eglinton-Woodbine-Keele for six months in an operation that was doomed to fail because of overly complex scheduling, crewing and line management. One of the doomed for failure “experiment” they tried for six months when the Bloor-Danforth subway opened was the Keele to Eglinton, Eglinton to Keele, Keele to Woodbine, Woodbine to Keele, Woodbine to Eglinton, and Eglinton to Woodbine routes. They had signs on the platforms that flipped to show the next train’s destination, and the destination sign on the front of the trains. It failed because they did not have destination signs at or near the doors. Still don’t have destination signs at or near the doors. Would be useful for short turns or out-of-service trains. Please wake me when Toronto’s subways reach this level of competence/complexity. I still think that an LRT would have been better for the Bloor-Danforth. Steve: LRT could not possibly handle the demand. Where did the extra trains, train crew and (most important) headway during peak periods come from? Joshua, Streetcars were running at almost 1 minute intervals to keep up with the volume of passengers prior to the opening of the Bloor – Danforth line. LRT was not even thought of yet when the line was designed and even if it was we would still have a subway now anyway. Not sure of the exact hourly stats but the Bloor-Danforth line as of 2016 must have at least 8000 people an hour. There is no way an LRT service could keep up with demand bordering on subway levels. Steve: The BD streetcar operated with 42 two-car trains/hour between Bedford Loop and Coxwell, the heaviest part of the route. That’s a comfortable load of over 6k with crush capacity pushing 8k. Frequent service on parallel routes (Harbord, Carlton and Kingston Road) picked up some of the demand from suburban feeder buses that now goes into the subway. The subway operates with a design capacity of about 26,000. In order to have an LRT service at those levels you would need an insane amount of cars running in an fully seperated ROW. Given the requirements it makes more sense to tunnel underground and put in a subway. I still say a streetcar (or at the very least bus) service on Bloor and Danforth to supplement the subway is not a bad idea given the high volume in the peak but demand is too high for anything but a subway. When the Bloor-Danforth subway opened, they reduced service on the streetcar lines that “feed” it, especially the King route. That didn’t last long, they had to increase the service. Steve: Yes. The boffins in the Planning Department mistakenly thought that demand on the King car originated at its terminals, or that traffic that rode south on Broadview and Ronces into the core could reorient itself northward. The original schedule cut service from a car every 100 seconds (1’40”) to every 240 (4’00”). A few months later it was back to 120 seconds (2’00”). Richard White’s comments about supplementary service brings to my mind two questions: 1) why was there not a “shopper’s service” bus along Bloor-Danforth as there was/is along downtown Yonge St. 2) why was it considered necessary to retain surface service with the 27 DOWNTOWN bus in the first place. Steve: There were a lot of seniors in the Yonge Street corridor, and concern that it would be easier for them to use a surface bus. As you know, the 97 now runs south into the core only during the peak period and then not very often. Given the article was written by James himself I was always curious how much of this actually happened. Not knocking you James but some of this seems far fetched. I remember this incident, particularly as it was only a year since the Scarborough RT had opened. One thing that struck me as odd at the time was that, at least in the wording of media reports, the threats were against Toronto’s “Transportation System”. The public group-think on that focused on the TTC, and a significant part of those using it made other arrangements. I do remember, as a student at Ryerson living in Agincourt, it was a week of some of the nicest commuting on the TTC. The term “Transportation System” stuck in my mind. It occurred to me at the time, if someone wanted to cause substantial damage, planting explosives under manhole covers in various places around town and detonating them when so many were afraid to take the TTC, and crowded into vehicles that were stuck in worse gridlock that usual, would be extremely effective. The other thing that I recall about this, and others can correct or confirm me, was that it seemed that quite a garbage cans in the subway system remained sealed well beyond the period of security measures. Perhaps it was only a few, but given the TTC kept information about the Spadina 77 bus posted for years after the streetcar line had replaced it, it’s not outside of reality to have this memory.